A weekly newspaper has honoured a band killed in a car crash with a new award in their memory. 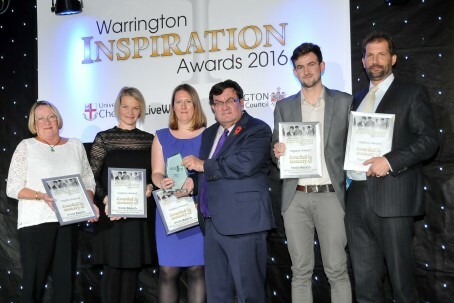 The Warrington Guardian presented its first Legacy Award to the families of Viola Beach as part of its Warrington Inspiration Awards. The band’s members – Kris Leonard, River Reeves, Tomas Lowe and Jack Dakin, along with manager Craig Tarry – died when the car they were travelling in plunged more than 82ft from a highway bridge into a canal in the Swedish capital of Stockholm. Since their deaths the town and their families have rallied to ensure they will never be forgotten, with a campaign launched by the newspaper to get the band’s music into the charts resulting in a top 20 single and subsequent number one album. Editor Hayley Smith said: “To lose one bright young star is a travesty, to lose five is incomprehensible. “Our Inspiration Awards are about giving recognition to those who have made a difference in their communities and we wanted to pay our own lasting tribute to not only the band, who were on the verge of having hugely successful careers in the music industry, but also their families for showing such incredible strength in the most tragic of circumstances. Speaking on stage at the awards, held at the Warrington Wolves rugby league team’s Halliwell Jones Stadium, River’s father Ben Dunne said: “You do not expect to lose a child, it is horrendous. It is life-changing.